This month’s challenge was quick pickles. I like red cabbage so I thought I would give this recipe a try. It was a tasty and attractive addition to our Easter meal. My jar of pickled red cabbage. I used a simple recipe I found online. I didn’t want anything too complicated in case I didn’t like the final result. Ingredients for a jar of pickled red cabbage. Shred the cabbage and carrots. I used a mandolin for the cabbage and a grater for the carrots. Make the marinade by boiling the water and adding the sugar, vinegar, and salt to the water when it comes to a boil. Stir until the sugar and salt are fully dissolved. Remove from heat. Keep the oil in a separate container. Fill a 1 liter jar about ¼ full with the cabbage/carrot mixture. Pack tightly. Pour about ¼ of the marinade and ¼ of the oil over the cabbage/carrot mixture. Pack it down. Your red cabbage is ready to eat but it is better if you give the mixture a couple of days for the flavours to meld. Keep in the fridge. It is good for about 2 weeks. I served this up with Easter dinner. It went over okay. My mom was pleasantly surprised that it was so mild. I was surprised that there was not real pickley, vinegar taste. My youngest and I both thought it was a little bland. The Man thought we were all weird and declined to take part in this culinary adventure. Overall, it passed. 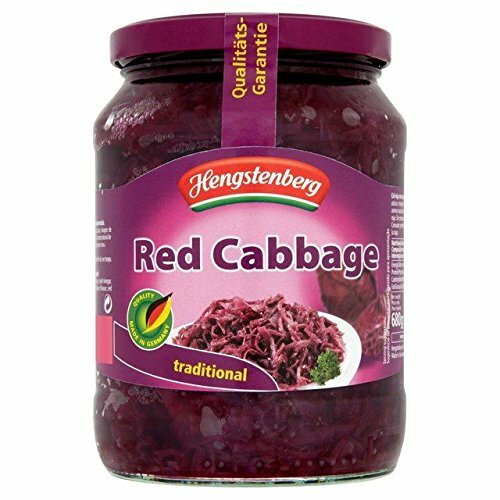 You can buy pickled red cabbage in groceries stores but it is not common – at least here in Canada. My little grocery store does not carry it but you can buy 550 gram jar for $10.19 off Amazon.ca, which works out to about $2.50 for a 125 gram sized serving. Wow! that’s a lot! $0.80 might seem like a lot for a side dish but it sure beats $2.50! I am developing a greater understanding and appreciation of vinegar. Previous to this challenge, my experience was pretty much limited to plain old white vinegar and apple cider vinegar. The white wine vinegar in this recipe gave this concoction a very mild taste. I still like red cabbage. I am pleased to have found a new way to eat it. The Man does not like vinegar in his food. My mom can still be convinced to try new things! A liter of pickled cabbage is too much for me. Yes I will, but I think I will add something, peppers or another spice, to give this recipe a bit of a kick as it was pretty mild. I think I am also going to try this stir fried and see what I think of it then. Since quick pickles only last for a couple of weeks in the freezer, I think I will look for shelf stable recipe for pickled cabbage, since I can’t eat a whole liter in a couple of weeks! Do you know the purpose of adding the oil? I’ve never heard of adding oil to anything pickled and it made me curious. I wonder about the oil too. I think it was to make it more like a cabbage salad with an oil and vinegar dressing. Personally, I think it was too oily. If I make it again, I will probably leave out the oil.